The Heart of the Rockies Initiative focuses its efforts on a region from southern Alberta and British Columbia to western Wyoming – the Central Rockies of North America. Within our working region are four distinct planning regions. 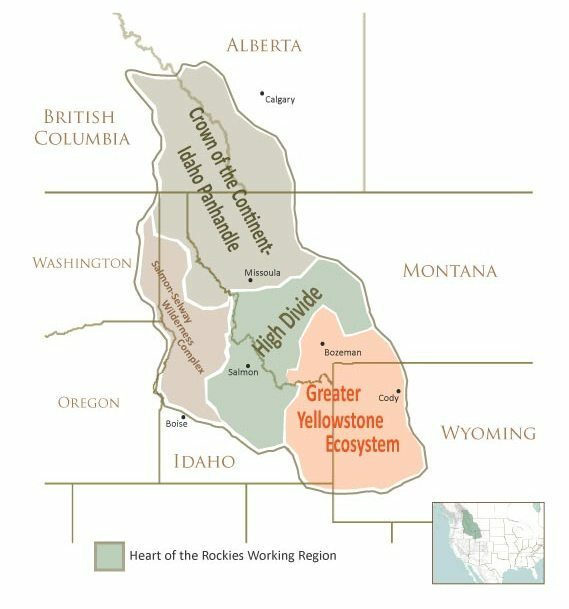 The Greater Yellowstone Ecosystem (GYE) is the southernmost area and surrounds Yellowstone and Grand Teton National Parks, including parts of Wyoming, Idaho and Montana. The High Divide straddles the continental divide in Idaho and Montana. The Crown of the Continent caps the northern region, encompassing parts of Idaho, Montana, and British Columbia and Alberta, Canada. The Salmon-Selway Wilderness Complex is the western region covering much of Idaho. Within the GYE, High Divide and Crown of the Continent, Heart of the Rockies partners have worked with communities and land protection agencies to create conservation plans to focus strategically on conserving the most important and most threatened private lands. The Salmon-Selway will be the next region where we will focus our conservation planning efforts.